We used state of the art acoustic measurements to capture the sonic fingerprint of the Phillip T. Young Recital Hall from many different perspectives. We then created a convolution reverb to "reproduce" the recital hall acoustics over a surround sound playback system. Method: We used a 5-channel circular microphone array to measure a matrix of 70 surround sound room impulse responses: At each of 7 listener locations, the response was captured for 10 sound source positions. 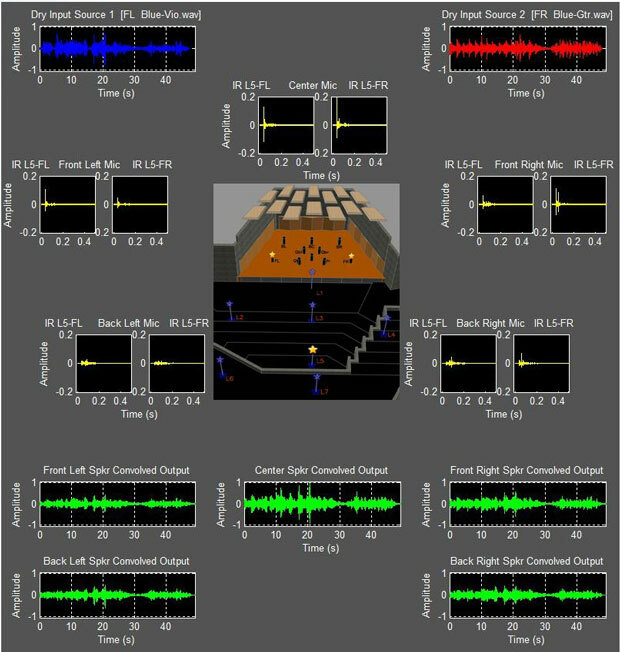 This source-listener matrix can be used to simulate the acoustic space from multiple perspectives. 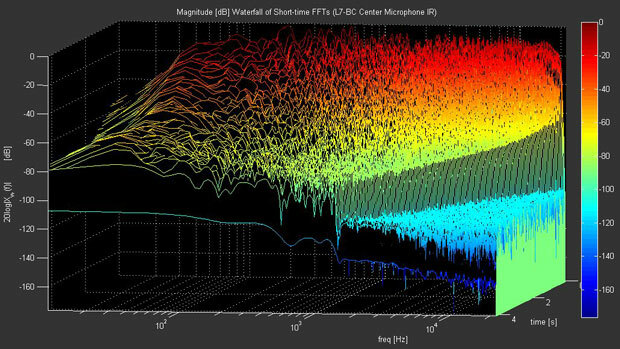 Time-frequency ('waterfall') representation of the center microphone impulse response, measured near the back of Phillip T. Young Recital Hall. Waterfall plots can be used to visualize the decay of energy in a room and how the reverberation time changes across the frequency spectrum. To test the results on listeners, we created a surround sound convolution reverb. 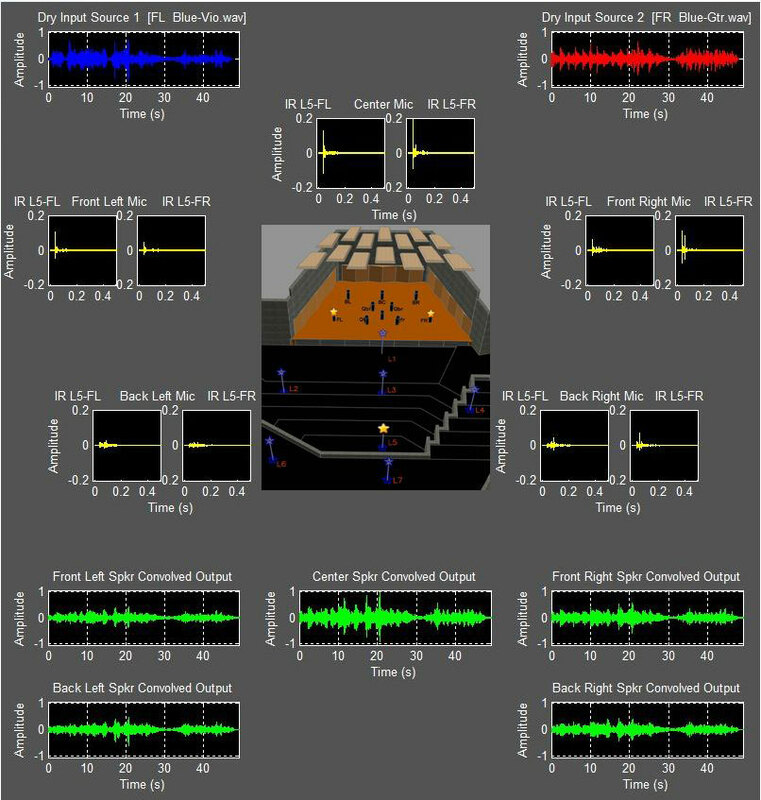 By performing multi-sound-source convolutions, dry-recorded signals can be virtually placed into the measured acoustic space. 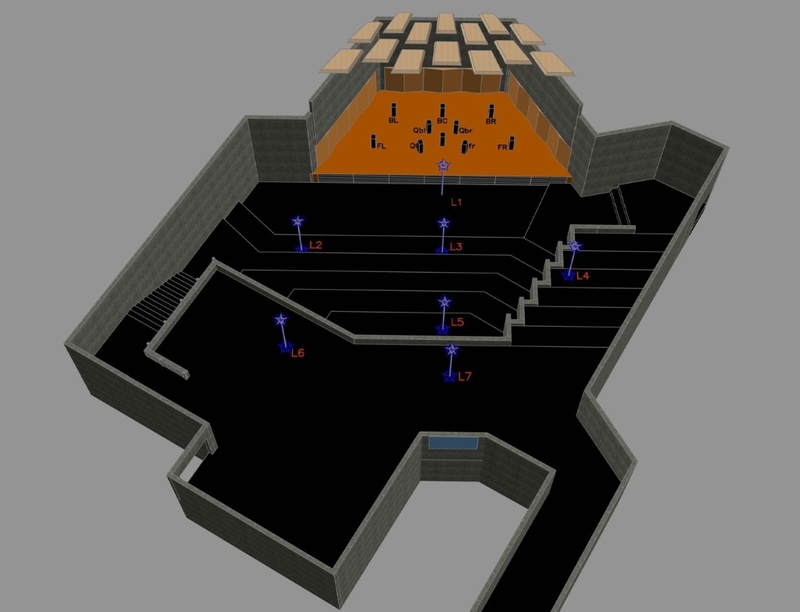 An ensemble with up to 10 performers can be simulated with natural sounding acoustics. Signal routing for room impulse response measurement (assuming one microphone channel). For a multi-microphone measurement, each microphone gets its own channel (signal path). Impulse response measurement setup shown on a model of Phillip T. Young Recital Hall (perspective view from a high vantage point). The room was excited using a speaker placed in each of 10 sound-source positions (on the stage). The room response was recorded using a microphone array placed at 7 listener locations (in the audience). 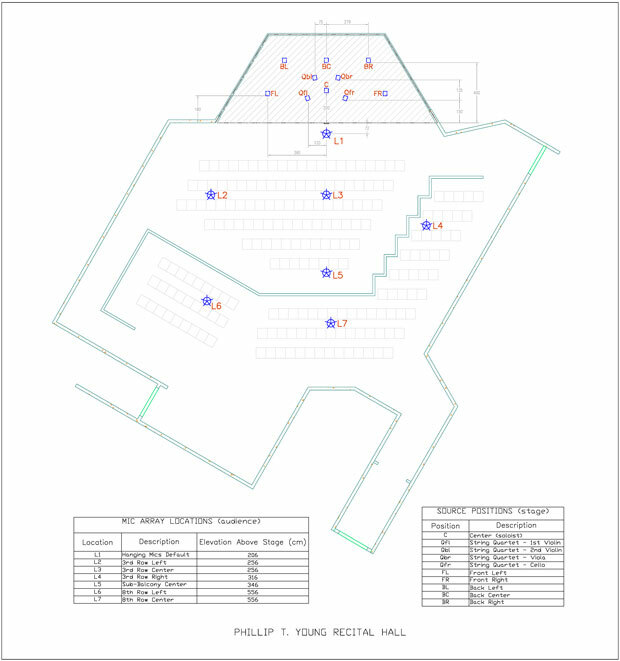 Source positions and microphone array locations for surround sound impulse response measurements in the Phillip T. Young Recital Hall. A circular array of 5 near-coincident hypercardioid microphones (Schoeps CMC 6-U) was used for recording the acoustic response in the Philip T Young Recital Hall. The 5-microphone circular array captures surround information through amplitude and timing differences between the microphones. 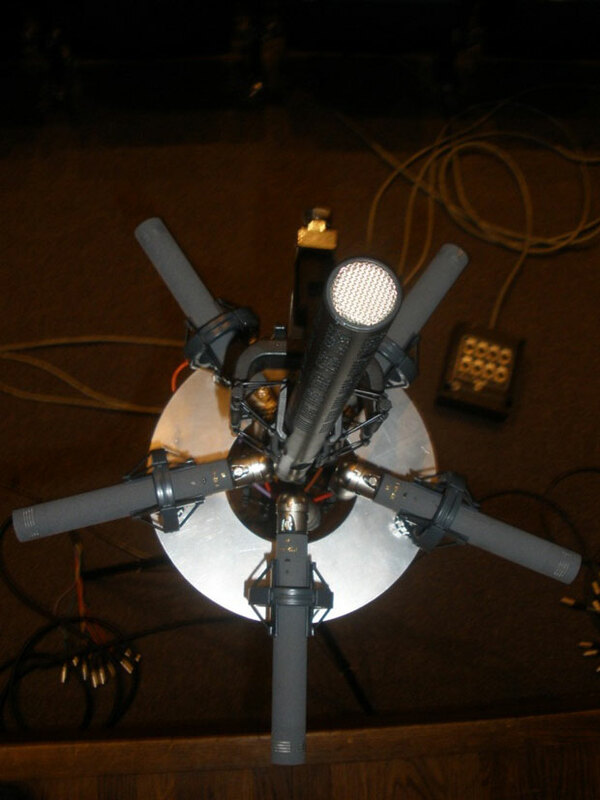 A 7-microphone spatial array is created by adding two shotgun microphones oriented vertically (one pointing up, one pointing down). These extra microphones enable 3D spatial recordings, an ongoing area of research at the University of Victoria. 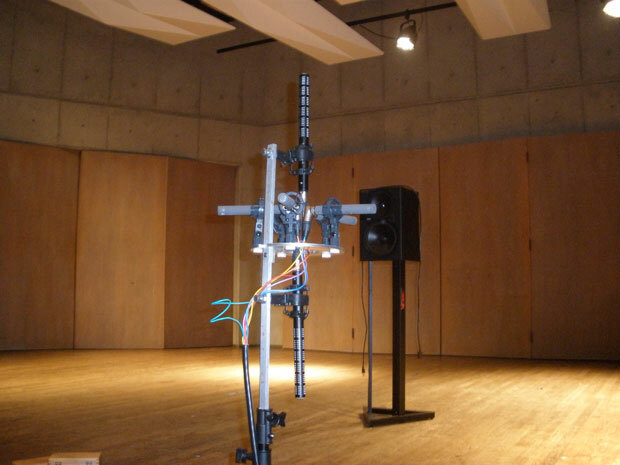 Spatial microphone array (height has been lowered for setup) with room excitation source (speaker) in the background. Extracted room impulse response. The signal-to-noise ratio (SNR) is about 100dB (equal to the dynamic range between the noise floor and 0dB peak). Multi-source convolution reverb (two sound sources). Each dry source is convolved with a different 5-channel impulse response, were each impulse response was measured at a specific location in the recital hall. Upon playback, each source sounds like it was recorded in the hall, at the location shown.